On October 5th at Literary Arts, Steve Almond and Jon Raymond explored sports and its role in American consciousness. They pondered complacency in violence. They struggled to rationalize this cooperation in something so wrong. Jon Raymond read from his novel-in-progress The Singers. 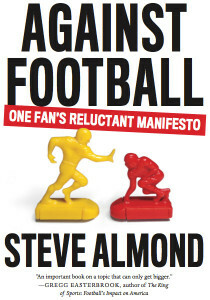 Steve Almond read from his contentious book Against Football. Raymond used third-person prose, Almond used statistics and personal experience, and together they created a thorough analysis. Jon Raymond’s novel The Singers follows a family for generations. Ben Singer was the main character in the excerpt read. This ex-military special forces fell into a PTSD episode while considering America’s preoccupation with baseball. Singer remembered the violence he committed in Afghanistan. Ultimately he questioned why some children are left free to play catch while other children die from misfired missiles, and why the US is perpetually at war. This socially critical prose was a prefect precedent to Steve Almond’s Against Football. There was nothing coy about his work – a full on attack against American football. Almond claimed that homophobia, violence, blind patriotism, and support of capitalism are some of the products of The United States’ favorite passtime. He explained how football’s popularization coincided with the Vietnam War. Football is everything that is not hippy and “The hippies had it right!” Almond shouted. He explored his own experience as a football fan, and admitted that no sports fan would ever pick up his book. His reading and off-hand comments ignited cries of support from the audience. Paul Martone, the director and founder of Late Night Library, interviewed both writers following their readings. Martone shared a few personal anecdotes and asked the writers what could fill a gap left by football. Raymond commented that he can’t imagine America without its favorite sport. Literary Arts thanks Steve Almond, Jon Raymond and Paul Martone. Special thanks to the lively crowd that contributed to the afternoon’s discussion.